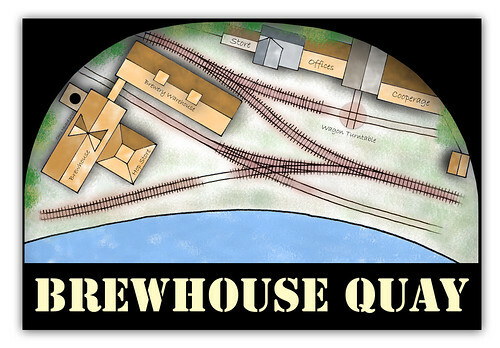 Just before the Xmas holiday I started to lay the track on Brewhouse Quay. The delay in getting the snaps here being due to that increasingly shocking excercise of actually interacting with people face to face (cue the H&S Executive for another new directive no doubt) rather than keyboard, eating all the wrong foods, drinking too much beer in foreign climes and probably in due course getting a dose of lurgy due to all public places being heated to suit the staff rather than the heavilly dressed public. Initially the plan was to use ready made track, but after messing about with Xtrkcad it came apparent that I would not be able to shoe-horn in the track plan that I wanted in to the small area. And anyway, with nearly all the buildings being ready to plant I needed to have some challenge having not built my own track since Catcott Burtle in 2008. 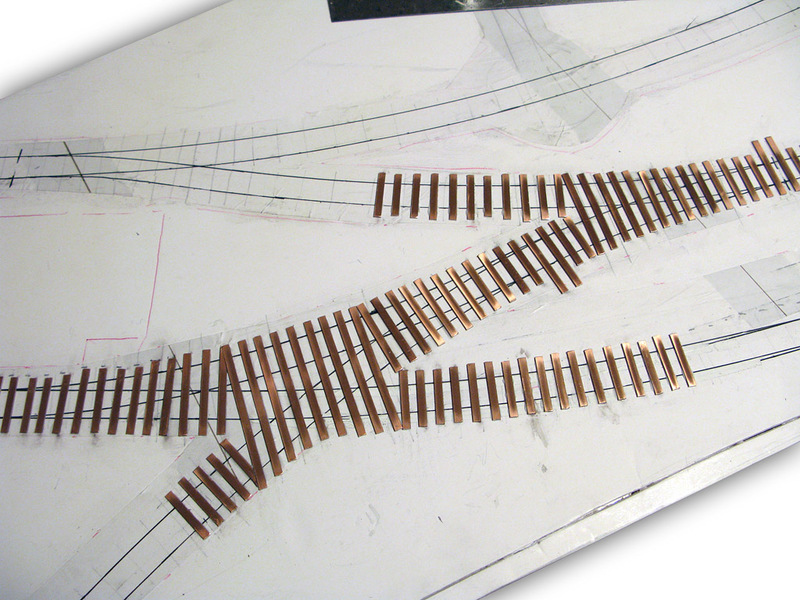 The track as you'll see is traditional copper clad construction, but rather than using the more usual code 75 bullhead rail I'm aiming for that light railway/industrial look using code 55 flat-bottomed rail marketed by C+L Finescale for OO/HO. Code 55 is about as light a code as one can go in OO realistically to avoid earlier ready to run wheel flanges bouncing along the sleeper tops. 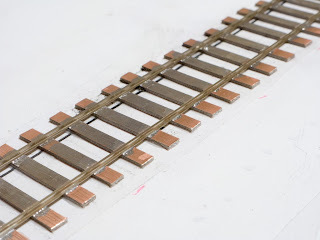 Seen here are the first few inches with rail laid, and those with keen eyes might just notice the destressed copper clad scratched to represent timber. Sleeper gapping to avoid a short circuit is just to the rear of the nearest rail so to avoid an unsightly groove when seen from the front of the layout. When soldering the rail to copper clad sleepers, to avoid that tell-tail look often seen with blobs of solder on the side of the rail spoiling that flat-bottomed look, I'm pre coating the sleepers with a thin coat of solder and then sweating pre-fluxed rail onto the sleeper surface. Whether I add cosmetic rail spikes remains to be seen, for much of it only the rail tops will be seen protruding out of fine ballast or cobbles and some of the less recent ready to run offerings may just brush the spikes. Such can always be added at a later stage when the layout is nearly complete. To the right and looking back to 2008, here we have Catcott Burtle after the C+L track was painted with various Halfords primers in preparation for ballasting. The baseboard top is plywood, but seen above is what looks like a foamboard base - correct! To make track laying easier due to the fixed high backscene that that surrounds 3 of the 4 sides, I'm using a removeable sub baseboard which will then be fixed permanently into place once the more tricky aspects of tracklaying have taken place. In due course, ballasting with diluted PVA could cause the foamboard to delaminate, so to avoid the possiblity of that happening as long as the whole lot is painted prior to ballasting this will not be an issue. As with other projects I generally use a blend of Halfords red primer, grey primer and matt black misted on in varyoing amounts. One could of course use Railmatch 'Sleeper Grime', but Halfords bonds to the metal better, dries faster and can be bought from around the corner. Version without the inset HERE! nevard_101226_munich-tram_IMG_8832_web, originally uploaded by nevardmedia. For a change we decided to escape the Christmas mayhem and head to Munich for a few days, not really for any cultural experience but unashamedly to sup a few beers in the various beer halls all over this beautiful city. And anyway, most things are shut over the Christmas period and let's face it, it's way too cold to do much else so I don't feel the slightest bit guilty in this respect! 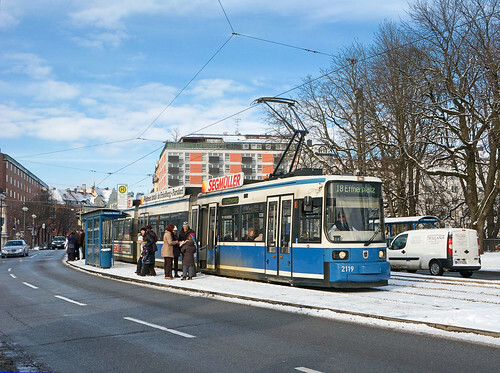 Of course one needs to get around, and I was most impressed with the 47 mile tram network and how the Germans don't let a dusting of that cold white stuff cripple everything. Every city should have a tram network, they're quiet, they get you from A to B very quickly and they don't leave everything under a cloud smelly smog every time they move. 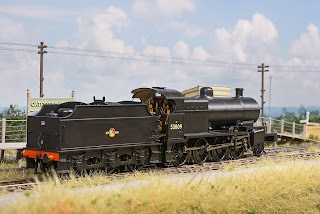 Bachmann's much anticipated SDJR 7F 2-8-0 has finally arrived at Nevard Towers from Hattons in Liverpool, and what a beauty she is too. I'll refrain from commenting in detail too much, because there are many merry souls who get out even less than me who'll no doubt keep the forums bulging over the next couple of months with stuff about the loco that you cannot see. 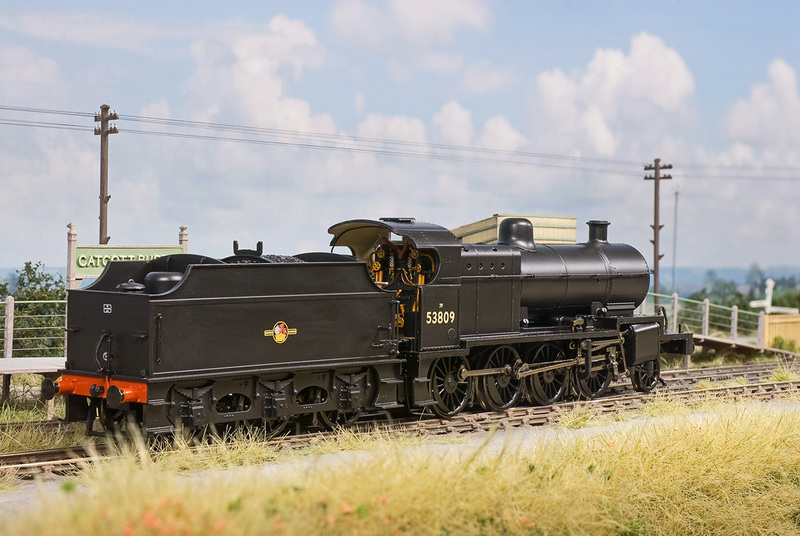 To me Bachmann have captured the look of this iconic heavy freight loco supremely well having gazed at photographs of the real thing for 30 plus years. In that period I've often thought about building a kit of one of these, but like many there is now little need. 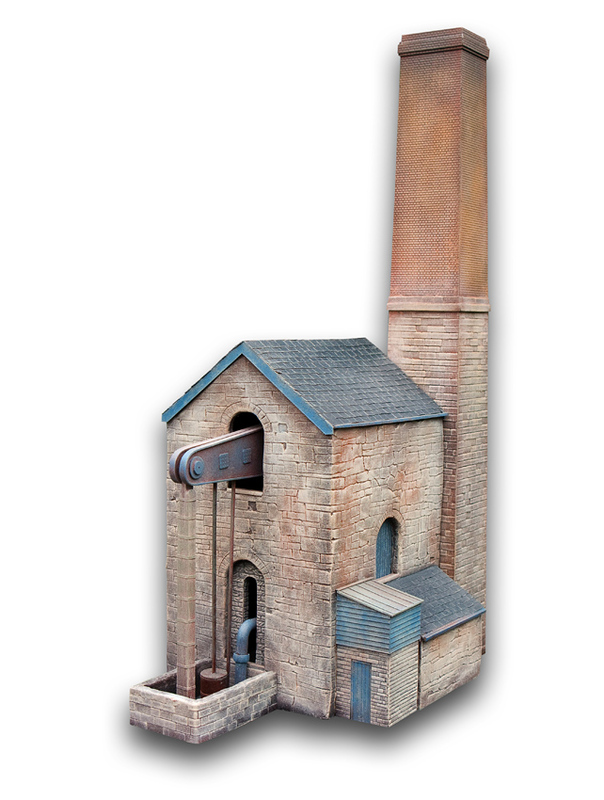 As a nice surprise, Bachmann have added the familiar Whitaker token exchange apparatus to either side of the tender – this was missing from the pre-production model seen back in the summer at their press and trade open day. 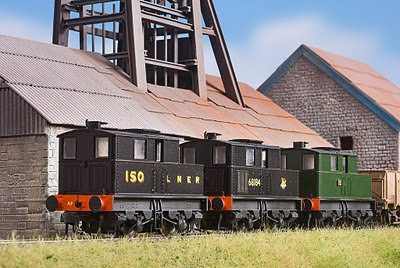 Thoughtfully they have included what looks like a couple of spares of this in with the detail pack; these might make their way on to another one of my engines in due course. So the loco can negotiate set track bends, the tender to loco gap is rather too wide for my requirements, but unlike Hornby this can be easily remedied by drilling an extra hole through the metal 'drawbar'. Toy train buffs from Tonbridge Wells will note that I have added the steam heating pipe below the front buffer beam - that is actually not required having examined photos after hurriedly adding the detail pack! I have yet to run the loco due to lack of time, though I imagine it will be a little notchy as is frequently the norm with Bachmann steam outline locomotives; hopefully though a good running-in session will reduce this to a minimum with choice of controller as usual having an equally significant effect. Whilst the loco undeniably looks stunning in its shiny black, in due course this little gem will go under the airbrush and dry-brush to add a little well needed ‘work-a-day’ patina. This hopefully will make it more in keeping with a freight locomotive as seen in the last decade of steam. A couple of years ago, if somebody had posted this release on April Fools’ Day we’d have dismissed them as barking mad! But the last 18 months have seen everything change in this respect with all sorts of weird and wonderful unexpected prototypes appearing ready to run. So, roll on that Johnson 1P 0-4-4 with condensing apparatus next I guess? nevard_101126_catcott_DSC_0545_web, originally uploaded by nevardmedia. W I D E C R E E N version HERE! Catcott Burtle is on the road again on Saturday 15 January 2011 at the Astolat Model Railway Circle Expo in Guildford. It's been well over a year since this layout last had an airing in public with it's last scheduled outing sadly being cancelled at the 11th hour due to a house move the day before. 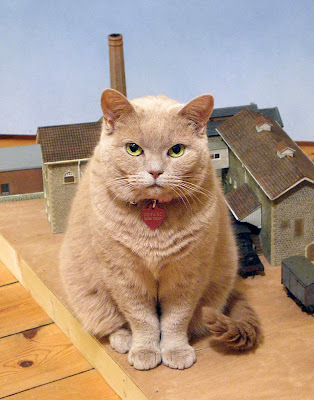 I often wonder who really looks at the toy train chuff chuff blogs, frequently imagining that it's just old duffers like me with not enough else for filling to do with their lives. 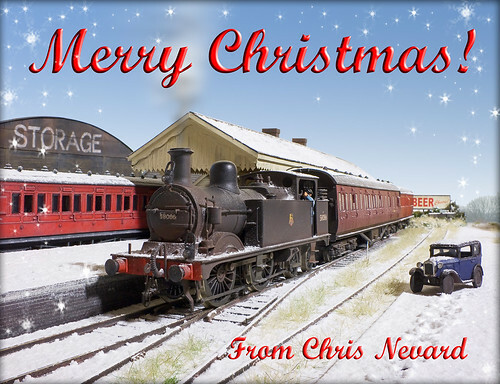 So over the last few days it was a great surprise to get not just one, but two emails from blog owners that do not for one moment appear to be model railway nuts. These merry souls have compiled list of their favourite railway related blogs and rather foolishly chose recommend my misguided jottings and pontifications on this silly hobby. Thank you! K_point_wiring_01, originally uploaded by nevardmedia. The materials have arrived, so I'm looking at the most complex bit of track well in advance to plan the wiring and where isolating breaks will need to be cut into the rails and how power will be fed to various sections. Slitting the sections will probably be easier after laying due to the fine nature of code 55. Point operation will be via manual miniature yard levers as in Nigel Burkin's feature in the April 2010 edition of Model Rail. Polarity switching will be under the baseboard, again as per Nigel's feature. Whilst I'm not new to building my own track, I've never been bold enough to try something like this. Construction doesn't bother me, but the wiring does as little, so any thoughts from people that find this aspect interesting feel free to feed back. I've uploaded the multi-layered Photoshop PSD file here to allow the blue isolating section bits to be added or hidden should anyone want to illustrate any ideas - credit due course the final write up goes without saying! I need to consider check rails too not shown here. 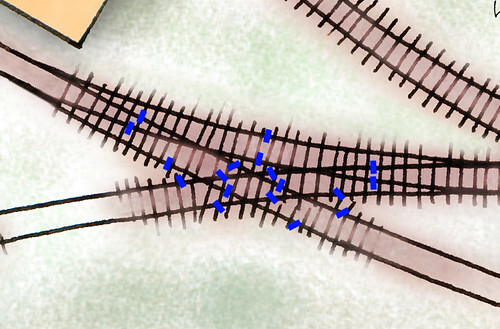 A wider view of the full trackplan can be seen here. Merry Christmas and a Happy 2011! xmascard_2010_WEB, originally uploaded by nevardmedia. Merry Christmas and a Fabulous 2011! 58086 on a cold but sunny snowy morning in 1957 awaits with the 11am service from Combwich to Evercreech Junction. nevard_101215_brewhouse_quay_01_web, originally uploaded by nevardmedia. 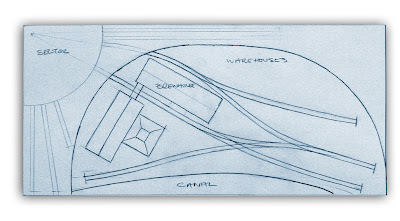 I suffered from a little insomnia last night, so between midnight around and 2 am I worked on my rough brewery trackplan pencil sketch to produce the below using a little Photoshop to tidy up some of the rougher bits. I've tried to avoid that computer look - preferring that 'back of an envelope/organic' style as seen in magazines like the excellent French model railway magazine Voie Libre and the wonderful illustrations of Paul Lunn. I'm in a lucky position to have been asked to come up with a model railway idea for a well known book publisher, but to date have been unsure which direction to go in - if at all with so many other commitments. Maybe a selection smallish plans mixed in with a section on how to photograph what you've built? Just a silly idea maybe - any thoughts on this already over saturated market? Back to the brewery; 'Brewhouse Quay' is likely to be the name of the current project, graphically the title works, and it's easy to remember. Just now I grabbed a couple of snaps to illustrate the Brewery Project's likely track plan all in an area of 4ft x 2ft 3inches, kicking off with an early rough sketch which will be used as a bases for a proper layout plan. 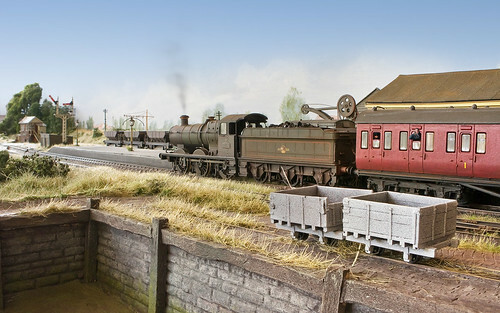 Note the sector plate to allow access to hidden sidings behind the backscene. 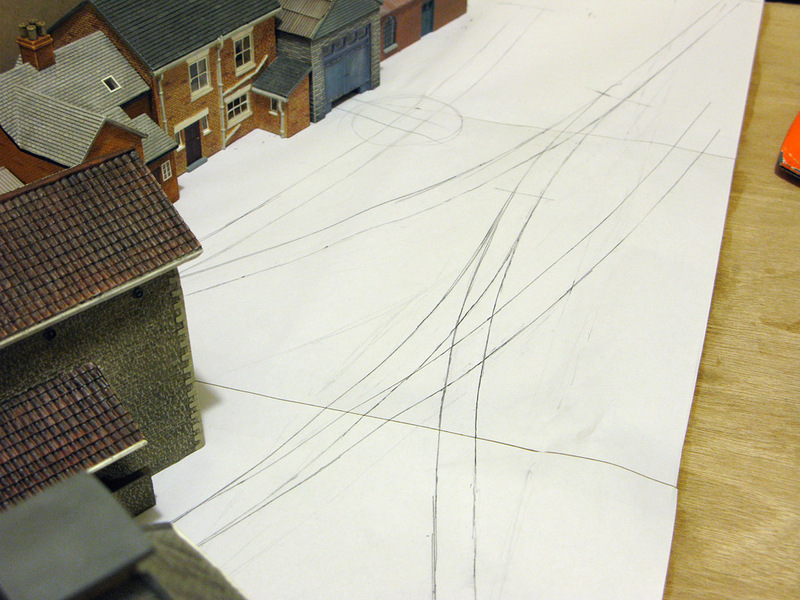 The headshunt seen on the above sketch will allow a small loco with just 2 SWB wagons - a shunting puzzle should be fun! Earlier in the year I had the privilege of photographing Brian Harrap's excellent Quai:87 which features lots of clever trackwork. See Brian's layout in print soon in the popular model railway press. nevard_101205_cementQ_DSC_0736_web, originally uploaded by nevardmedia. 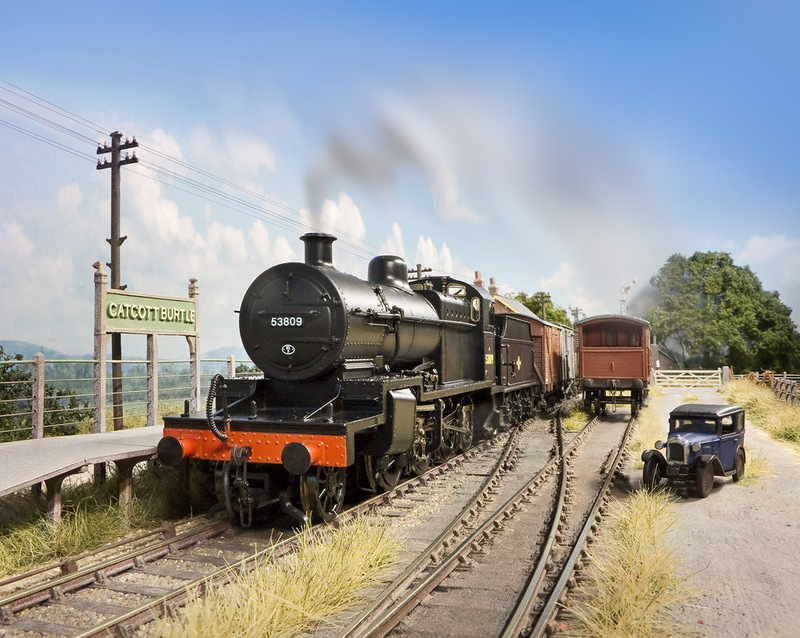 As a brief reminder of warmer times, under a high pressure summer sky, Ivatt 4MT 2-6-0 No. 43017 pulls away from the stone screens at Cement Quay. Tech: this shot was simply taken with a long exposure under a single ceiling light in the spare room where Cement Quay was set up for a few days. Today a bit of work turning flat earth into a proper baseboard ideal for show presentation. Bendy MDF is great stuff from B&Q and ideal for curvy backscenes.There is still some fascia work and panelling to add of course. 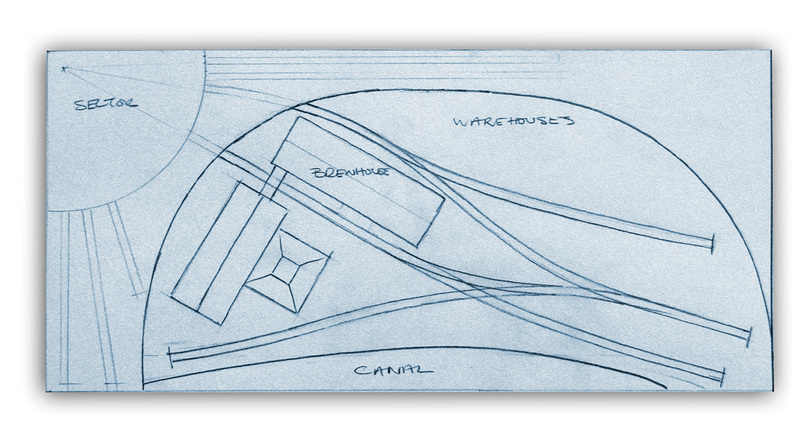 The trackplan has come together, it being fed from behind and between the two key brewery buildings. Off stage there will be a sector plate which will feed 3 hidden staging siding behind the backscene. Neither of the 2 exit points will be visible from the normal viewing angle. The sector plate will also complete the run around loop. When I design track plans, I don't resort to computer programmes, they simply don't interest as well as it taking me as long to master the software as to build a whole layout, and anyway, I spend enough time in front of a computer. I use a nice bendy baton to help draw nice sweeping transitional curves using something from the olden days called a *pencil and *paper - weird but it works for me. *Google it. 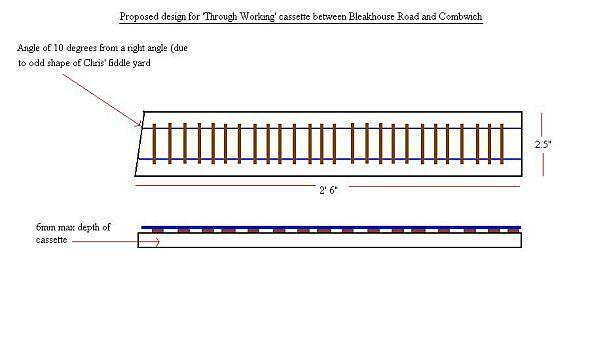 Trackwork despite initial thoughts of using Tillig ready to lay track, this has now changed to building by own using code 55 conductor rail on copper clad from that light railway industrial look - this way I get exactly what I want as with Catcott and Combwich which also feature home constructed track (not Peco as many people think). Generally speaking copper clad runs better, will be more reliable over time, and easily fixed in the event of failure. I might turn the two Skaledale houses in shot into brewery offices and with some suitable repainting and weathering I should be able to blend them in with other structures. To their right I quite fancy scratchbuilding building a stone and wood warehouse which could be served by a wagon turntable - though quite whether there's any point in making a working one I'm unsure. The slightly lower bit at the baseboard front will allow some kind of canal to be added, to add interest it probably won't be dead straight as here. But as usual, nothing is cast in stone so to speak, and none of the above may happen! It's sometimes great to have a break from more long term projects with this one so far being a lot of fun. Oh yes, the gauge is OO 'bodgerscale' (I hate 'finescale', it means nothing and if it does, is usually disappointing) with a scenic 3ft 6 x 2ft area on a 4ft x 2ft3 baseboard constructed from ply, stripwood, some MDF, glue and a little blood! Brewery Project Approved by the Cat! As a brief diversion from my Mendip Colliery project, and because I have a spare freshly made 4ft x 2ft baseboard kicking about as well as a keen magazine editor hungry for stuff like this, I've decided to do a quickie in the form of a brewery based around the excellent Bachmann Scenecraft Oak Hill Brewery buildings. Interestingly enough, the Oakhill Brewery did really exist, and in the early part of the 20th century was served by a 2ft 6 inch gauge railway from the standard gauge S&DJR at nearby Binegar. Sadly the brewery closed its doors for good in 2004 when its owner retired. The real buildings have however since been converted into private dwellings. 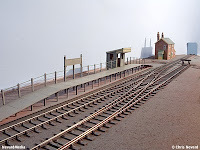 My project will be standard gauge, and whilst I have yet to design a trackplan, it's likely to be a simple run-around loop with a couple of sidings coming off it to allow a little shunting with smaller locomotives like a Pug and the forthcoming Model Rail/Dapol Sentinel. Why the cat? Well she (Fleur) made a pretty picture I'm sure you'll agree, and obviously she approves of the baseboard and buildings dotted about on this fledgeling project. 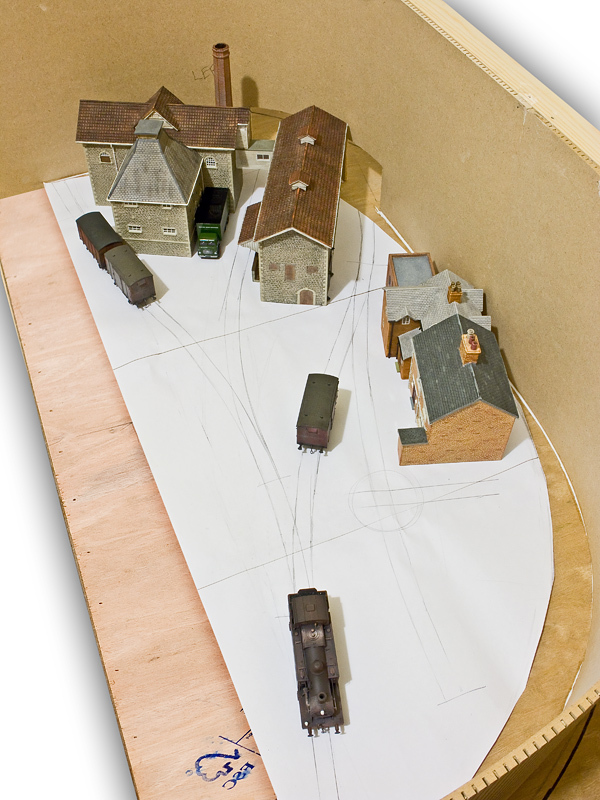 Mock up of possible brewery layout, with all trains entering and leaving via a tight alleyway between the brewery buildings. nevard_101129_cementQ_IMG_8485_web, originally uploaded by nevardmedia. Carrying on the theme of steam along the lines of those seen in the excellent Railway Bylines, but on Cement Quay and to remind us of dusty summery days, here's a grab of a Southern Railway built 'Black 8' No. 48660 nearing the end of its days shunting some Dogfish ballast hoppers under the number 2 loading screen. 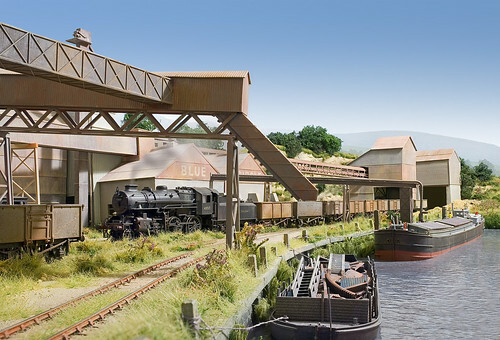 Lack of hostile responses from the diesel only brigade has confirmed that next time I chase up a show for Cement Quay it will be temporarily exhibited as a steam era layout. The La Farge signs will be removed and the red and white striped works chimney replaced with something a little more old fashioned by borrowing one from Mendip Colliery. A bigger version of the above photo can be seen HERE! nevard_101128_cementQ_IMG_8459_web, originally uploaded by nevardmedia. A tiny ex Lancashire & Yorkshire Railway Pug is captured shunting wagons through the loading screen at Cement Quay. This little loco I picked up on Ebay just over a year ago, it has since had a repaint, a renumber to one of Radstock's shunters, a little extra detail and a dose weathering. After completing the above and being an 0-4-0 I wasn't expecting the best performance, with some sticking, wobble and jerkiness due to just 4 wheels. But, after a good run in and widening the wheels to the non-OO spec back to back of 14.7mm it runs a dream through all sorts of track from Peco to handbuilt C & L. I'm sure the widening is the key because the reduced side to to side play has improved electrical pick up. I notice too that this little loco is again part of Hornby's 2011 range. All we need now is one of the keen cottage etchers to produce a replacment cab, the plastic one looking rather too thick, just cabside overlays would do - any takers? nevard_101128_catcott_IMG_8455_web, originally uploaded by nevardmedia. I must admit to when photographing model railways, apart from the odd cut-away sort of shot to show a cameo or fine detail when shooting a layout for publication, I tend to always have a train in shot somewhere. This is probably something to do with the fact that inevitably that's what I end up doing when photographing full sized railway scenes where the train is very much the star. In an attempt to break the habit, here is Catcott Burtle with not a train in sight. Imagine all that can be heard is a distant milking parlour, the twittering of the birds and the westerly wind blowing through the willow. Steam Power on Cement Quay? nevard_101128_cementQ_IMG_8463_web, originally uploaded by nevardmedia. 2-8-0 superpower as 48660 pulls a rakes of steel 16 ton mineral wagons away from the loading screen on the wharf at Cement Quay. 101127_uru_DSC_0617_web, originally uploaded by nevardmedia. As a diversion from the usual toy chuff chuff stuff, meet 'Uru' the latest acquisition to the household. 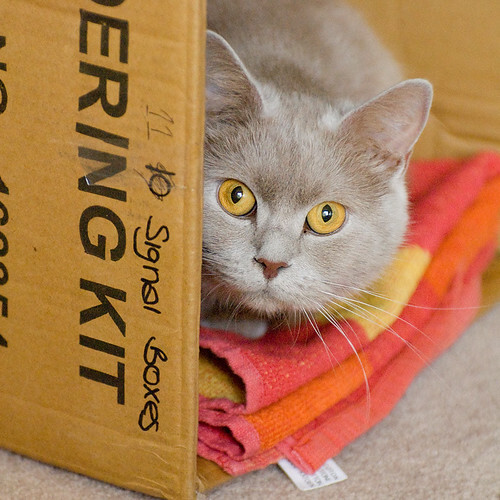 'Uru' is a British Shorthair and she is the great grand daughter of Fleur one our other cats. nevard_101126_catcott_DSC_0551_web, originally uploaded by nevardmedia. Southern Railway built 8F No. 48660 collects a smart but ancient LSWR Road Van from the siding at Catcott Burtle. W I D E S C R E E N W A L L P A P E R HERE! nevard_101124_catcott_IMG_8438_web, originally uploaded by nevardmedia. 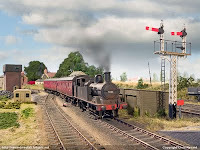 In the late summer of 1964 Ivatt Class 2 tank No. 41248 slows for Catcott Burtle with the 2pm service from Evercreech Junction to Highbridge. Note the gleaming ex-works Hawksworth brake composite passenger coach and the Southern Railway bogie parcels van for cheese, cider and another perishables. The coach is my most recent item of rolling stock, and it will of course be weathered in due course. I intend to add a yellow band above the first class section. 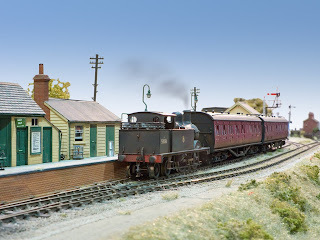 A single Hawksworth coach and a bogie van was a typical formation for Highbridge branch passenger trains in the final few years on the former S&D. Pic: this was taken on a little Canon G9 in natural north facing window light with the camera resting on a bean bag. Exposure was 1 second at f8 which is the little Canon's smallest aperture. 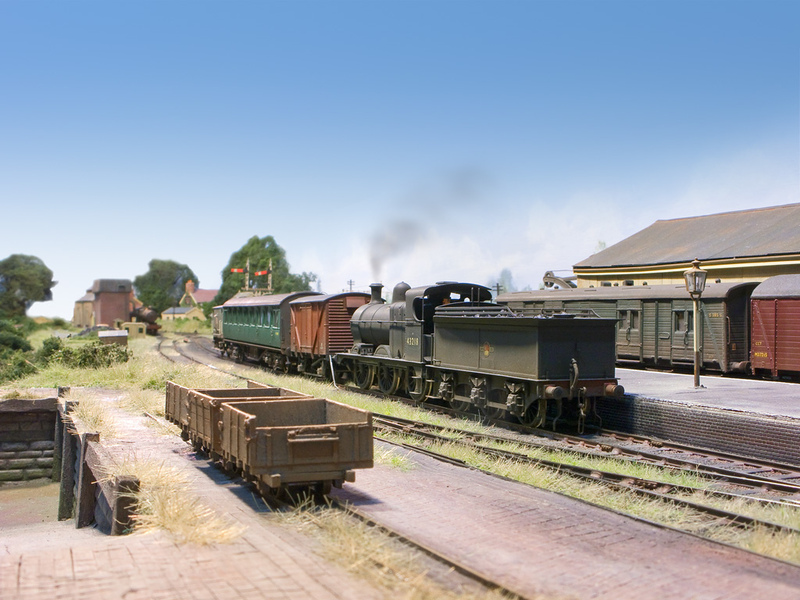 The backscene is not a fake one added after the photo was taken but an actual high photographic one attached to the rear of the layout and created from a panorama taken near the real location. W I D E S C R E E N computer wall paper can be found HERE! nevard_100705_pithead_IMG_7394_web, originally uploaded by nevardmedia. 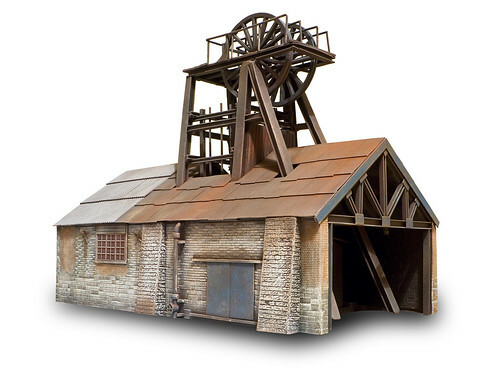 If you buy Model Rail Magazine, you might have read my little piece about Mendip Colliery, my 4 x 2 foot coal mining micro layout project. Due to space restrictions the finished shot of the pit head building is couldn't be shown too large, so to prop the feature up here is a BIGGER VERSION of the photo of the finished building. They say that conventional communication using pen and paper is dead; not quite the case, for a very helpful and knowledgeable gentleman mailed my via the editorial office some most useful information about coal mining in the Mendip area after reading the feature in the mag. He said all that is missing from the above model is a ladder to allow access to the wheel (shieve) and possibly some ironwork above to allow the wheel to be winched out and replaced. These can be addressed at some stage pending some suitable prototype photographs. Thank you sir! The next installation of Mendip Colliery in Model Rail Magazine will revolve around building a Cornish Pump house, not using ready to plant bits and pieces as a bases, but a full scratch-build. On the left is a sneak preview of the almost finished structure. nevard_101115_combwich_58086_IMG_8408_web, originally uploaded by nevardmedia. People who know me know that I'm not one to be taken for a ride by cottage scenic manufacturers passing off household products as bespoke items for model railways, then charging 1500% over the odds for sticking it in a small clear bag and a trashy photocopy. OK rant over, the snow is cream of tartar, something that you will probably have in your larder with a sell by date of March 1993. And oh yes it vacuums off by the way! W I D S C R E E N wallpaper version here! nevard_101109_CQ-oldquarry_DSC_9887_web, originally uploaded by nevardmedia. Bath shed's 8F 2-8-0 No. 48660 propels a short rake of 16 ton mineral wagons under the loading screen at Cement Quay Old Quarry Wharf. This shot was taken under available artificial room light rather than studio lighting and there is no computeryjiggery apart from the fake smoke effect. A lot of people new to photography these days think it's all done on the computer, sadly I'll have to disappoint them because good old photographic techniques still rule. Whilst much can be done on a computer to compensate for poor or inexperienced technique, it's still better to get it right in the first place abiding by rules that go back to the era William Fox Talbot. However, digital has allowed colour photography in a wider range of lighting situations than in the days of film, because it would be near on impossible to colour correct under today's low energy domestic lighting. And of course to add a bit of fake smoke one no longer needs to resort to cotton wool which is better left in the wife's make-up bag. 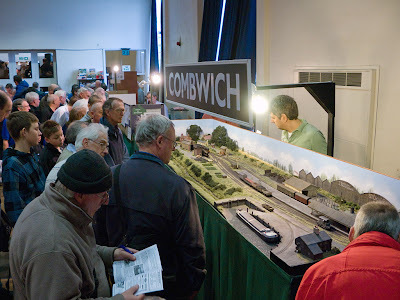 Combwich's first outing in 6 years finally took place at Wycrail in High Wycombe on Saturday 6th November at what is rapidly becoming 'the' quality one day show in the SE. On Friday night Combwich was crammed into a hired Ford Transit for it's 35 mile journey first thing the following day. After an easy 45 minute ride pretending to be a yob in a van from Guildford to High Wycombe, I managed with a little help from Ian Redgate who'd come all the way down from Mansfield the evening before, to get the layout set up in about 40 mins. 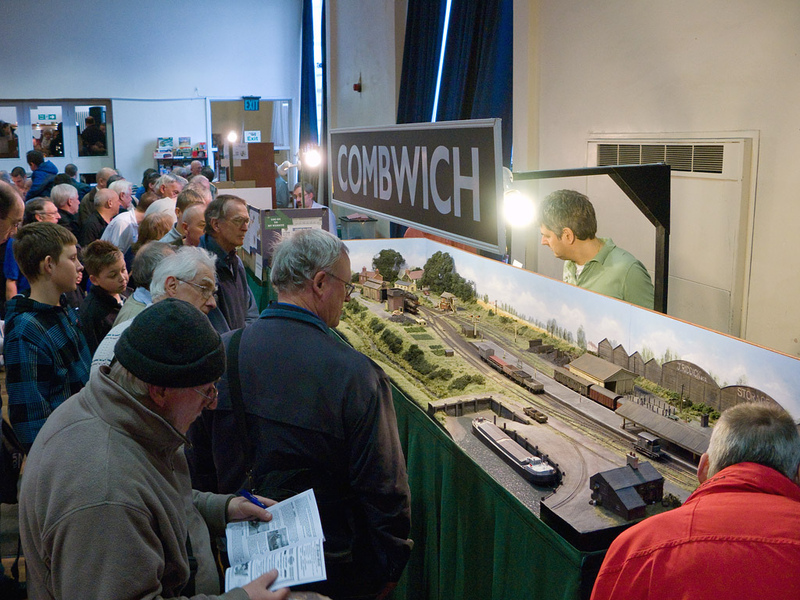 This is surprising, because Combwich was never designed to go on the road, with baseboards varying from 5ft 3 to just 18 inches long as the layout has evolved in length and width over its 30 or so years existance. With everything looking good, the power lever was cranked on like firing up the Frankenstein Monster for the first time. Everything appeared to work as it should until I set the road running parallel to the platform, then everything went dead, deader than Nunhead Cemetery on Boxing Day, and not what one wants with just 45 minutes before the doors open! Fault finding wasn't helped by the fact that I had temporarily lost my reading glasses! After 25 mins of much cussing under the layout I tracked down (more a lucky break as the result of random prodding and shaking) a couple of wires that had crossed and the problem was resolved much to my relief. I then found my glasses hanging safely off the backscene - duh! At 10am sharp, the eager punters started to wander forth in all shapes and sizes. As you no doubt know, model railway buffs are a mixed bunch from the darn right weird to elequent and intelligent upstanding members of society who are real pleasure to chat too, and as usual I got to meet all of them. There were by all accounts a few smelly ones too, but luckely I didn't have a pleasure of meeting any of these, but Combwich is quite wide with a high backscene, so distance may have masked me from the smellier of the smelly brigade who've converted their bathrooms into somewhere to play Thomas and keep their dead mother's stuffed head. The highlight of the day and something mooted over a year in advance of the show, was to attempt run trains between Tim Maddocks' superb Bleakhouse Road and Combwich, and this we did via a bespoke cassette that could carry an entire train between fiddle yards and then allow it to continue its journey via the respective layout to its destination and then return. Much fun was had making up the oddest train formations to try to flumox the crew of the opposing layout. I imagine because of this there'll be several letters of complaint in the next issue of the Model Hornblock Journal with the usual miserable set getting hot under the collar about us having the occasional bit of fun. Operationally the layout considering its hasn't been let out for 6 years worked reasonably well, but was occasionally spoilt by the odd derailment due to a sloppy locking mechanism on the station throat point. Looking to the future, and with this in mind, and with some of the other points starting play up as the day went on I've decided to remove all the old Peco units and replace them with something a little more positive in action before the layout's next outing at RAILEX at the end of May 2011. After chatting to several people about this, it would appear that something called COBALT is the way to go. Oh yes, before I vanish back to the real world, Wycrail is the only show so far where exhibitors were served delicious homemade cake actually served at the layout - now that has to be a first! Roll on next year! 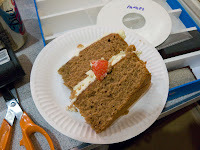 For a section of happy snaps from the show, CLICK HERE! Blogger Phil Parker also went to Wycrail, read his REPORT! nevard_101105_combwich_58086_IMG_8335_web, originally uploaded by nevardmedia. After leaving the solitary passenger coach in the platform, 58086 was captured shunting the coal wagons into the coal road of Combwich Goods Yard. The little loco, a Johnson 1P 0-4-4 is from a Craftsman brass kit is the very first proper loco kit I built was back in 1982. 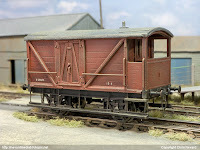 The wagons are a couple of British 'Railwayised' former private owner wagons from Hornby that came free with a British Railway Modelling Magazine subscription. 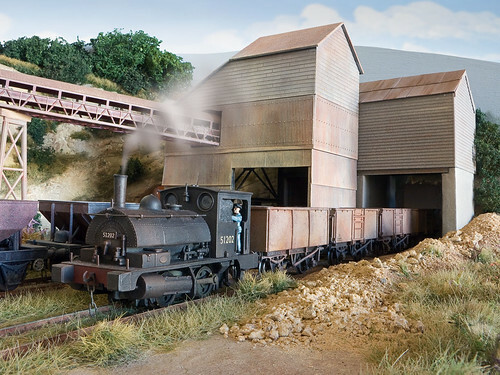 The LSWR roadvan is from a delightful resin and plastic kit by the Isle of Wight based Smallbrook Studios. 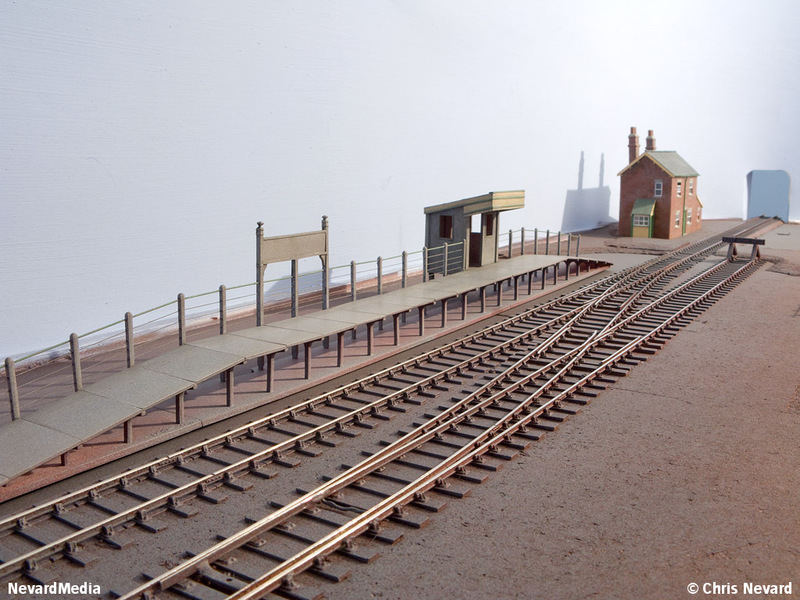 With just a couple of days remaining to WYCRAIL, serious thoughts have been going on behind the scenes of just how Bleakhouse Road (above) will be conncted with Combwich to allow through workings. nevard_101102_combwich_58086_IMG_8334_web, originally uploaded by nevardmedia. Mixed trains ceased to be part of the UK railway scene at least half a century ago. I imagine passengers hated them, any journeys being very slow due to wagons being picked up and dropped off at various sleepy stations on what was probably a journey from nowhere to even less-where. Captured here for your enjoyment on 10 asa Kodachrome 1, is one of these sleepy services arriving at Combwich hauled by an ancient Johnson 1P 0-4-4 sometime in 1952. The loco here is the first proper kit I built (Craftsman), there's a date on the underside saying 1982 - that's quite scary because it doesn't feel too long ago. MRJ snapper and loco-guru Phil Hall gave it a mechanical up and under a couple of years ago, and I must say that it now runs a dream! The coach is a Ratio Midland brake-end, it's in fact part of my engineering train, but it looks the part even though these low roofed Midland coaches probably didn't make it much past the 1930's in revenue earning service. W I D E S C R E E N wallpaper HERE! nevard_101102_CASTLE_DSC_9862_web, originally uploaded by nevardmedia. It's not generally known, but route availability was briefly thrown out the window in 1962 when No. 7034 'Ince Castle' powered an RCTS railtour down the Combwich branch. Here is the beauty departing the terminus for the return leg to Paddington via Bridgwater. 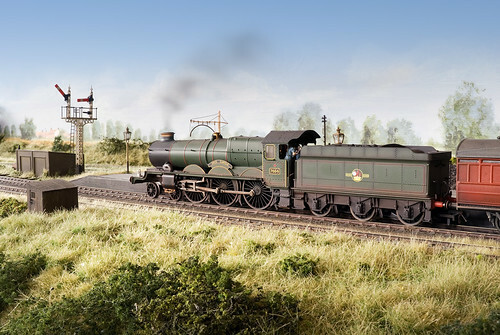 This is the Hornby Castle which is currently gracing the cover of MODEL RAIL 150. I've been lucky to be the temporary custodian of this delightful piece of fettling by George Dent for the last couple of months, but now it is time for me to say good by as I prepare to give this delightful locomotive back to its rightful owner. Before it goes, and seeing Combwich is all set up in preparation for WYCRAIL this weekend, it would have been rude not to put the old girl in front of the camera lens again for one final snap. The 150th Model Rail has just started to hit subscribers' doormats, with over the counter sales a little later in the week. Big Picture: An unusual conversion project was unveiled at Model Rail Live. 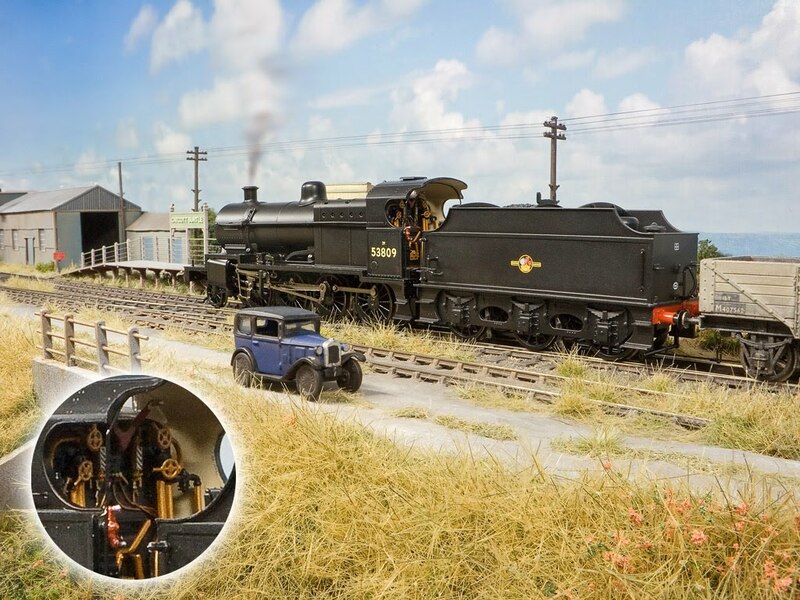 One Big Weekend: If you didn’t make it to Model Rail Live at Barrow Hill, here’s what you missed. 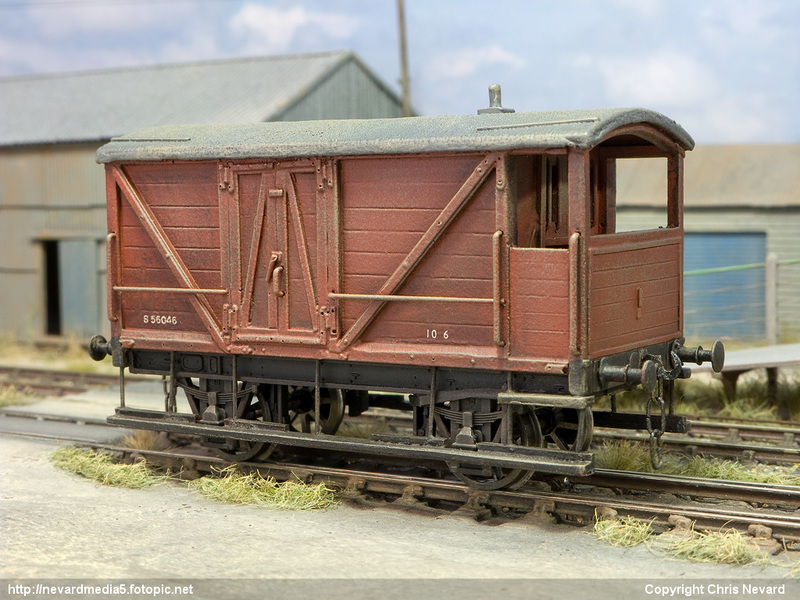 New FNA wagons from Bachmann, big diesels from Heljan and a first look at all-new 4mm Mk 2 coaches. 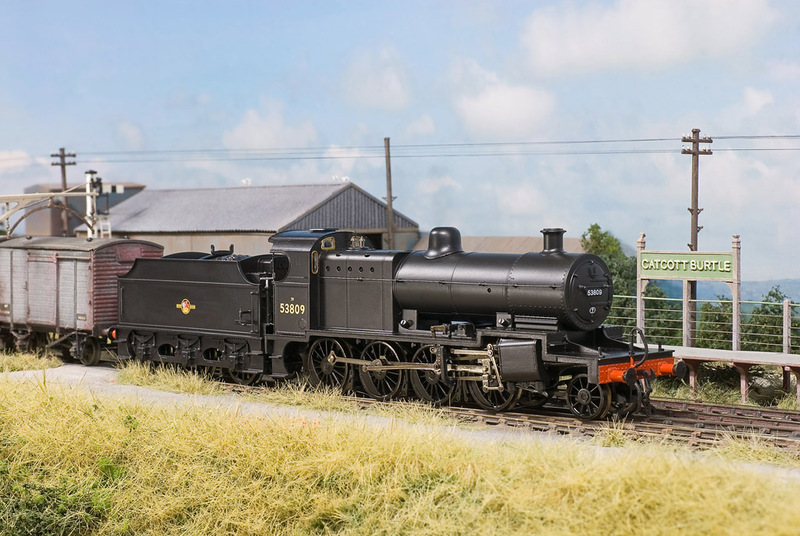 Reviews: Hornby’s ‘L1’ and Railroad Class 40 and Bachmann’s ‘A2’ and ‘Autoballaster’ come under scrutiny from our experts. Free car for every reader! Turn to page 31 to find out how to claim your free 1:76 scale car. 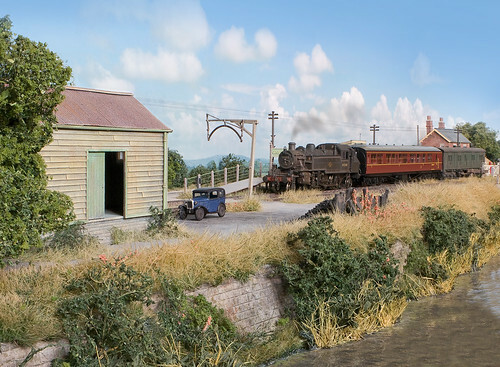 Madder Valley Railway: Chris Leigh delves into the history of John Ahern, one of the key links between the pre-war trainset and the modelling hobby of today. Pretty in Pinxton: Alex Fisher tells the story of the signalbox that inspired our latest limited edition. Christmas Gift Ideas: Leave these pages open at home, it will give your loved ones some great ideas for December 25! Network News: Network Rail’s Class 950 DMU can be justified on any modern-era layout. George Dent shows you how to build it. Warley 2010 Preview: Here’s your essential guide to the Warley National Model Railway Exhibition. Only here for the beer: Railways and brewing were inextricably linked. Ben Jones looks at the movement of beer and the possibilities it offers modellers. Building Eastwood Town: Want to build your dream layout? Gordon Stolliday offers hints and tips to get your project under way. Build an exhibition layout: How to do you design a layout destined for a life on the road? Ben Ando explains all. 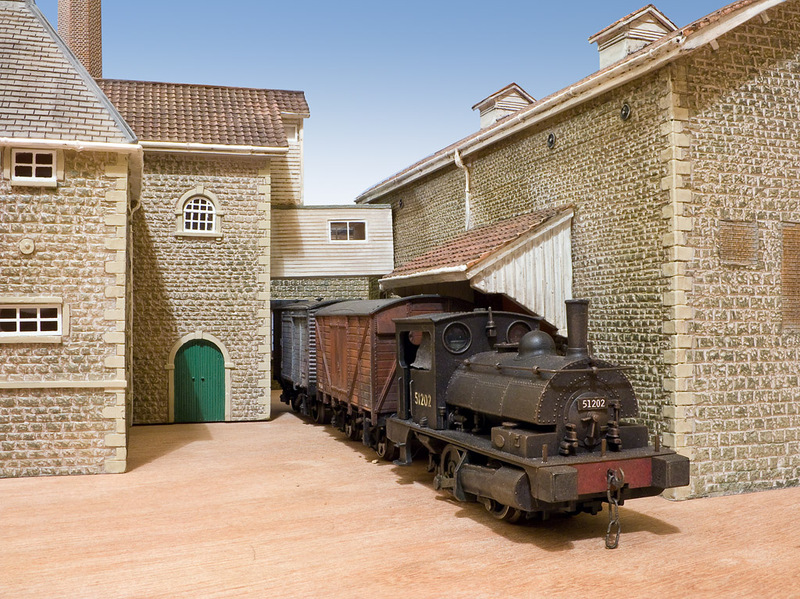 Making Mendip Colliery: Chris Nevard describes how he detailed and improved some resin buildings for his latest layout project – a Somerset colliery. Supertest: Trees; Every layout needs them, and tree aficionado Peter Marriott gets to grips with what’s available. Pendon Perfection: Chris Nevard was granted exclusive access to the ‘Vale Scene’. Prepare to be inspired! 1960: Britannia rules? Robert Forsythe looks back to the eve of the ‘Swinging Sixties’ when BR’s ‘Britannia’ was threatened by an electric from Austria. Masterplan: Borchester: ‘Borchester Market’ contains everything we might want from a layout. Here’s how you can build your own version of this classic. Buy exclusive models online or by telephone from our all-new shop. Britain’s Model Trains: Our unique and comprehensive guide to RTR models is out again on November 11. It’s fully refreshed and updated for 2011! 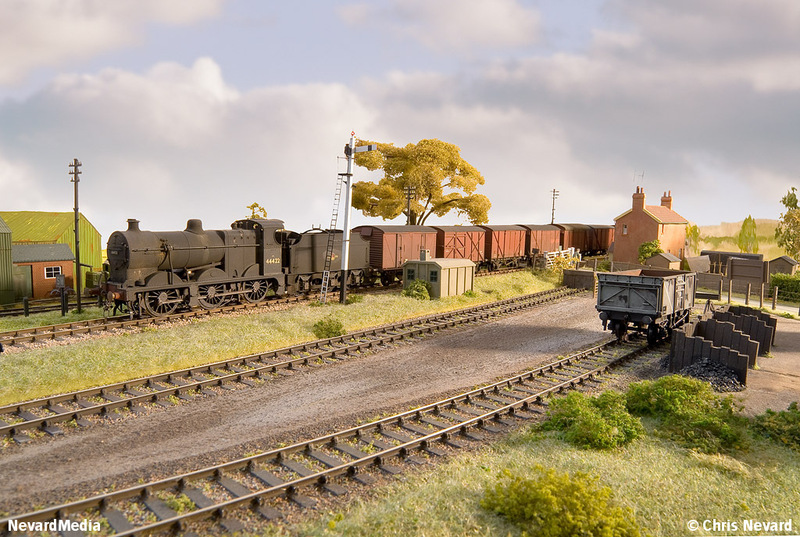 Q&A: Your modelling questions answered by fellow readers, experienced and expert modellers. 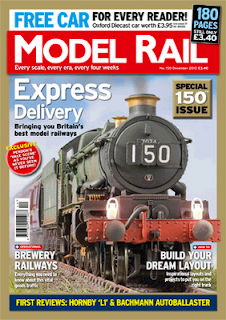 and in MR151: Three great layouts, top kit-building advice and the ultimate guide to ‘N’ gauge modelling - coming next time. nevard_101031_combwich_48660_IMG_8289_web, originally uploaded by nevardmedia. 48660 prepares to depart Combwich Station with a mid afternoon service to Templecombe on the 10th of October 1965. This afternoon I finally finished off the 8F with a good dose of dry-brushing using creams, leather, earth, pale grey and finally black (just to take the edges off) in front of the computer looking at Barking Bill's FLICKR website for inspiration. I will replace the pony wheels next time I get to a good show with such suppliers. I have to say that this loco runs and absolute dream. Photographically I just used the natural window light with a long exposure, and this is just what the eye sees too including the backscene. The only trickery is the fake clag. W I D E S C R E E N wallpaper version HERE! See this layout and the 8F for real at WYCRAIL! nevard_101030_combwich_40564_IMG_8281_BW_web, originally uploaded by nevardmedia. 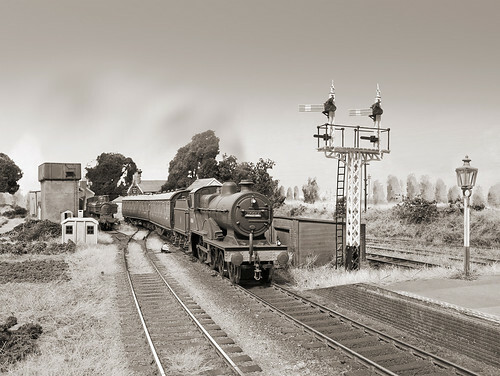 40564 was one of the very last elegant LMS 2P 4-4-0s left running on the Somerset & Dorset, and is captured here rolling into Combwich with the 10 am Templecombe service on the 21 August 1961. By this stage the Western Region has been in charge of the northern section of the former S&DJR network for sometime and its influence could be seen with the ex GWR Pannier tank No. 4691. Had the photo had been taken in colour you'd be able to spot the WR brown and cream paint on the old oil lamp mounted on an old piece of rail to the right, these colours replacing the previous green and cream. Back to reality, the loco is Hornby with a repaint and a few extra bits and bobs, it will get a proper Comet chassis in due course once I've saved up some pennies to get it properly done by a pro (I'm a disaster with such wizardry). The signal on the right is a designed to upset the purists in the form of a Ratio LNER plastic kit with a few mods and some MSE finials to make it look sort of 'LSWR'. 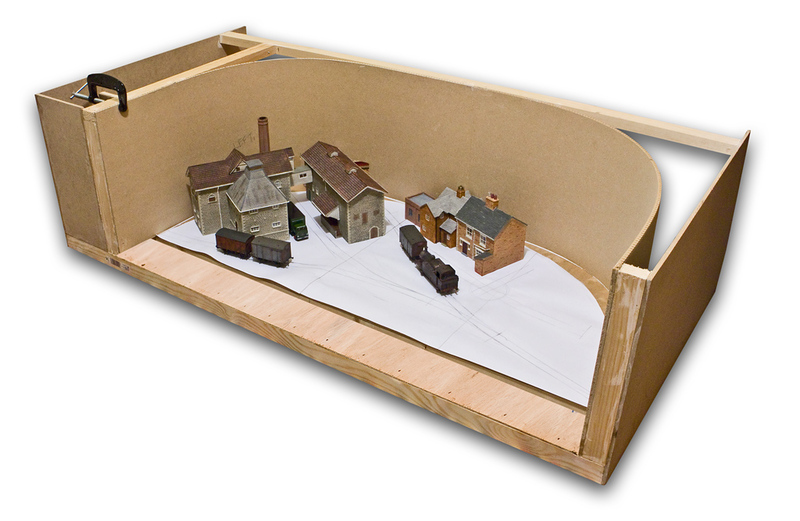 See this layout for real at WYCRAIL on Saturday 6 November '10. *Ivan Locksmith of course is fiction like much of this post, he is a character based on the actual celebrated photographers Messrs Ivo Peters and Norman Lockett who between them recorded much of the SDJR. nevard_101029_combwich_3206_IMG_8262_02_1280web, originally uploaded by nevardmedia. 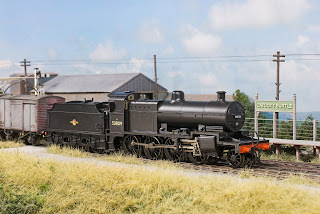 Ex GWR Collett 0-6-0 No. 3206 prepares to depart Combwich with the 4.30pm service to Templecombe on the 30th of September 1963. 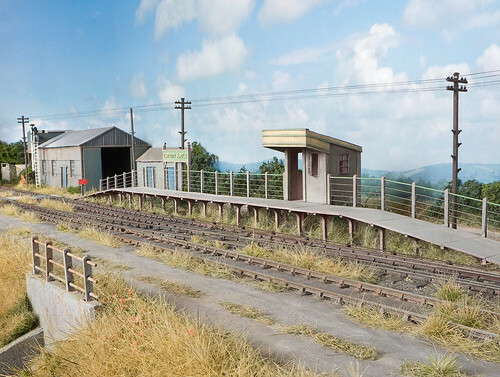 The narrow gauge trucks in the foreground are used on part of the narrow gauge quayside tramway. The natural daylight reflecting off the LMS subs (repainted and detailed Airfix) highlights the minor failings of Flushglaze with the rounded edges. Yes, that is me riding the cushions. CLICK HERE for a 1280 x 800 pixel version which is ideal for widescreen wallpaper.